While proper care and regular dental exams are a great way for maintaining your oral health, some patients may require additional help. Californians who ail from impaired or missing teeth face a myriad of complications and risks that can create continual issues throughout their lives. 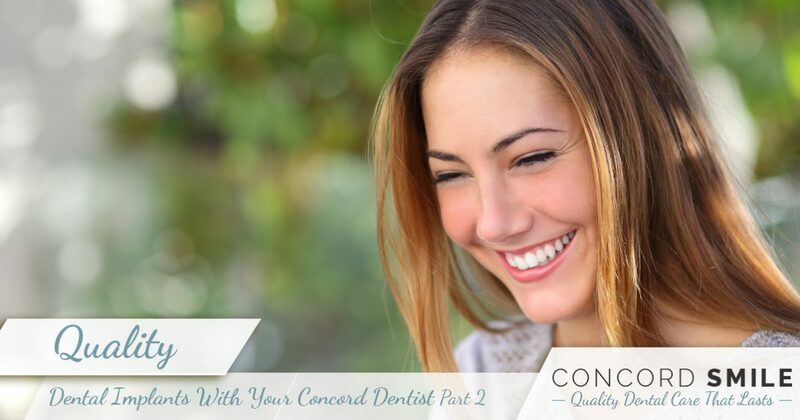 As Concord’s restorative dentistry experts, our practice is here to provide quality dental care that lasts. Concord Smile proudly offers general, restorative, and cosmetic dentistry services to help all of our patients regain their beautiful smile and live life to the fullest. Dental implants are one specialty that requires a lot of expertise and attention to detail. Today, we’ll continue to look into these permanent dentures and the benefits you can expect from undergoing the procedure. When you’re ready to make your appointment, be sure to reach out to our experienced dentists by contacting us today! Permanent solutions. Fumbling with dentures and maintaining dental bridges can both prove to be a hassle. Implants are built to last 30 years, and with proper care, they can last a lifetime! We see this procedure as a long-term investment for patients. No more adhesives. The glue used to secure dentures has been in use for a long time, but recent questions have raised the concerns of what is in this unenjoyable product. Beyond smelling and tasting bad, denture adhesive contains chemicals and minerals such as zinc. Excessive exposure to zinc may lead to a host of neurological problems. Solid lip support. When you are missing teeth, your smile and skin can suffer. Many people complain about wrinkles and lines where the concave appearance sets in from a gap in their teeth. With a fuller appearance, the lips will also look thicker and more natural as well. Better chewing abilities. Dental implants work to mimic your natural teeth, providing a stable surface for eating. Dentures (especially loose ones) are helpful for chewing, yet they are not stable enough to be an effective tool. Implants work to deliver more biting force, making eating a much more enjoyable experience. Excellent fit. The pain and discomfort from improperly fitting dentures can hamper a patient’s quality of life. By fitting and securing your dental implants properly, our experts are able to provide a comfortable fit that provides a lifetime of quality. Bone structure retention. As we have mentioned before, a missing tooth will lead to resorption, where the bone begins to resorb and neighboring teeth begin to drift into the gap. If left untreated, severe malocclusion can occur, where the teeth become very misaligned. Malocclusion can greatly impact a person’s quality of life. There are many benefits surrounding dental implants, yet the procedure isn’t flawless. Next time, we’ll look into a few risk factors and health requirements surrounding dental implants, as well as the importance of doing so now rather than later. Concord Smile is proud to be Concord’s restorative dentistry experts, specializing in the practice of fitting dental crowns, implants, and more for our smiling patients. Contact us today to learn more about our practice or to schedule your first appointment!